This is my VW soap box. I'll cover things reagrding my hobby, keeping my vintage 1957 stock oval window running and in sweet condition. My wife and I bought our mango beetle in 2004 and have cared for it ever since. There is something about these small cars that got under my skin when I was 15 and I haven't stopped loving them. 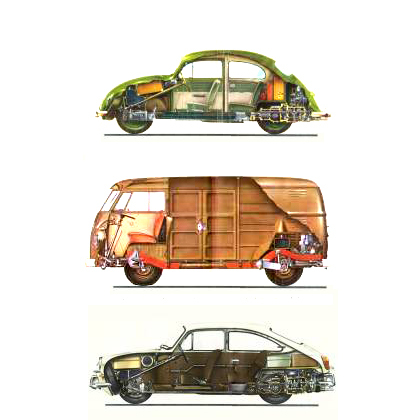 I joined the VVWCA which keeps extending my education on the history of beetle. VEE DUBS & BITS 02.14.10 - Copperstate 2010. 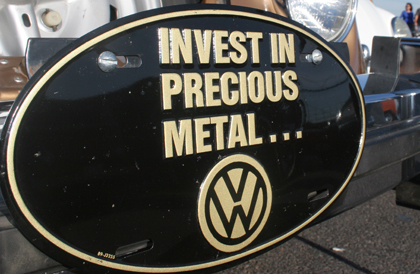 Valentine's Day 2010 was a hard sell for me to go to the Wolfsburg Registery Classic VW Show for my wife. 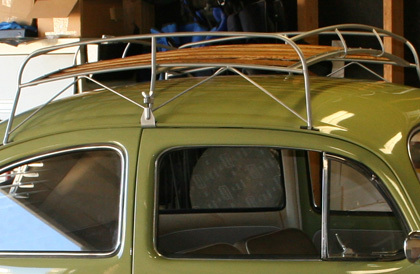 She is an ardent vw enthusiast and owner. So, when I surprisingly came home with the first prize plaque for '57 and earlier it was much easier to celebrate that night! Thanks to all the friends at Wolfsburg Registery who put on the Copperstate Classic VW show at University Technical Institute. Check the image gallery and see the largest VW bus ever created and the 5th oldest beetle in existence shown by Richard Christensen of Prescott, AZ a 1943 black KDF-Wagen, amazing. VEE DUBS & BITS 03.29.09 - Bug-O-Rama 2009. Today was an amazing display of authentic and custom German automobiles. 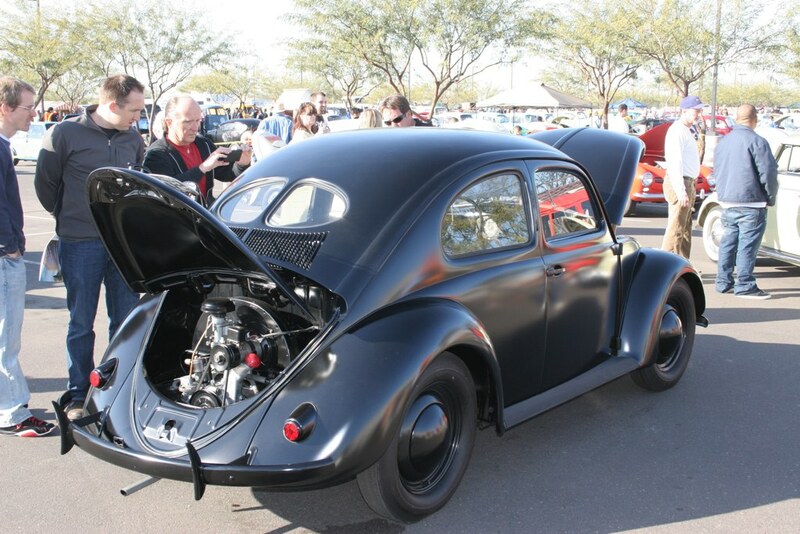 The Bug-O-Rama 2009 at Phoenix Firebird Raceway was a gas! Here I am with my newwest cohort "Leif". He roled up in his recently acquired 1956 Beetle that I have only seen on the internet. 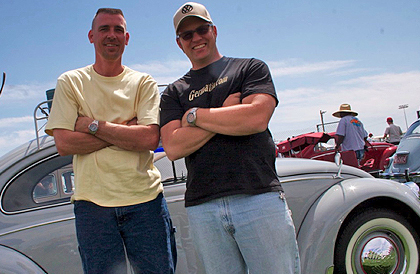 His bug has been a long time inspiration for me renovating my '57 and to see the car live and in person was a thrill. 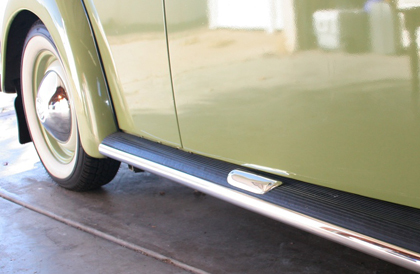 He placed Second behind "Jim's 1950 mint beetle" and ahead of "Greg Medico's pristine 1957 Beige". Great job guys! Also featured at this show was the rarest of the rare, "Hebmuller". You can see those and al the picture that my son Gordon took while we paced the rows slowly and rekindled acquaintences that I look forward to seeing again later this year! A shout out to some great friends like Mike Clark, Steve White and Andrew Price who always make the day great! Ja Vol! VEE DUBS & BITS 02.16.09 - Copperstate Classic - !st Place. Today was an amazing day in Avondale, Arizona. 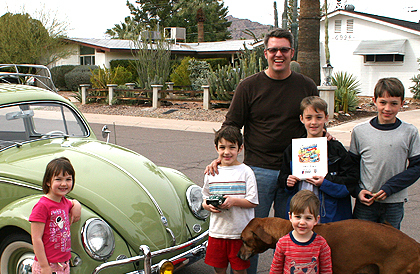 The Wolfburg Registry hosted the 11the Copperstate Classic VW Show. There were so many great classic and custom cars and buses on display. 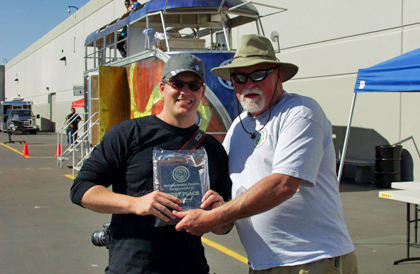 My good friend Mike Clark displayed his '68 Empi VW and was awarded runner up in his division. Andrew Price another great friend brought out his '71 Campmobile Westfalia which was amazing. I was blown away to receive first place in my division an award I was able to share with my two oldest sons. Memories to last a lifetime. VEE DUBS & BITS 01.31.09 - Getting ready for Copperstate. Worked on the oval today. 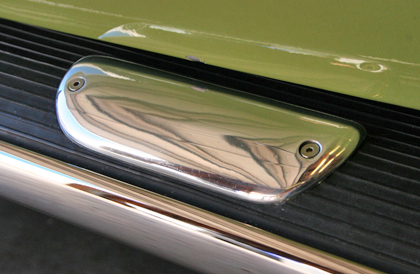 Place up stainless steel runners and boot scrapers. They were so easy to place and they make the car look like its wearing a tux. It should look nice in February for the show! VEE DUBS & BITS 11.03.08 - Karl's Custom VW Show 2008. This year's show was a gas, although the judging was totally stacked. It was great to connect with old friends like Marvin and his 1960 turquoise bug, he took first place. My good friend Mike Clark brought out his vintage 68' while I rolled out the oval. The day went great as we got to see some cars I've never seen before including a vintage Fridolin or mail wagon, and a custom one man squash bug. When the judges handed out the prizes every division received a first and second prize, except for the 50 -57 stock vintage class. A beautiful '57 oval took first place and no one announced a second place. Guess my oval wasn't a favorite even though it was in tip-top shape. Oh well, maybe next year. Here are some pictures from the show. My niece Isabelle, an aspiring artist and drummer used ths photo to draw a sketch from. 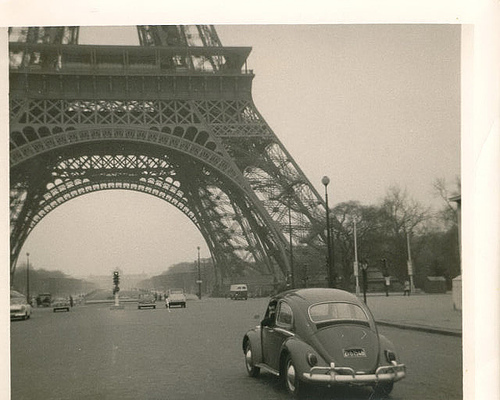 A great vintage photo that would have been amazing to be present for back when you actually could drive under the Effiel Tower. VEE DUBS & BITS 09.18.08 - It has come. 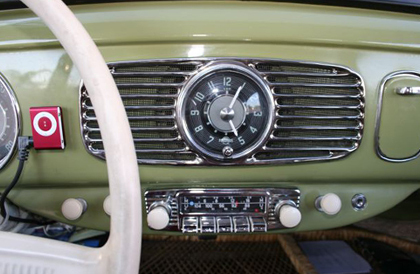 It's been a month since I installed the vintage Blaupunkt Frankfurt Radio and I couldn't be happier. It's connected to a single 100 watt speaker that my son Ian and I put it and it sounds perfect like it should from the 50's. 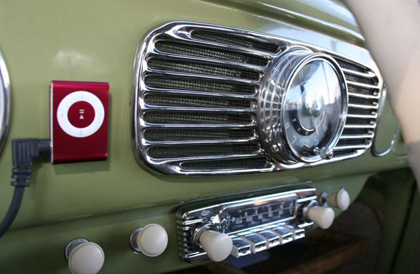 The radio is loud and scratchy, with pops and clicks when you tune in a station and the iPod works phenominally. There really is nothing like driving a vw with tunes playing. It's an experience everyone should have. VEE DUBS & BITS 07.28.08 - Greetings from Germany. 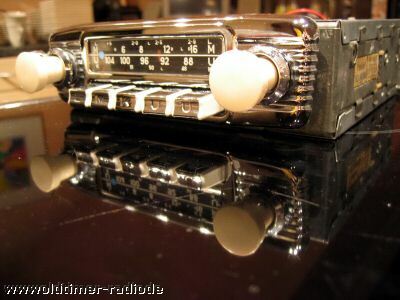 I am tracking a vintage Blaupunkt radio I purchased from Old Timer Radios. Sent from Nottuln, Germany to Scottsdale, AZ via UPS from my friend Matthias, this radio is an original German 60s style Blaupunkt radio type Frankfurt. 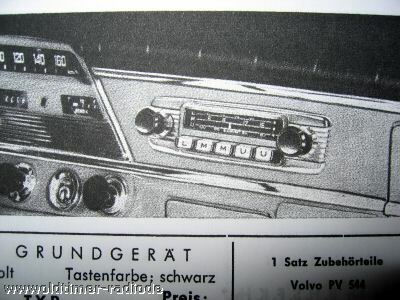 The radio is said to have great sound providing L=longwave, M=AM, K=SW and U=FM. 12 Volt. It comes with a nice faceplate and very rare chrome selection keys. It will also iPod ready! This should complete my dash and is a long, long awaited item. 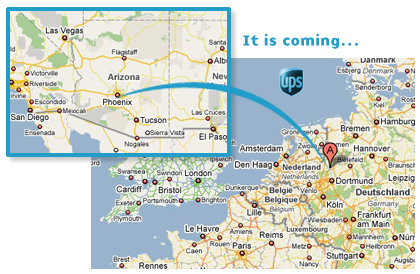 I'll post pictures once I received the package! VEE DUBS & BITS 07.15.08 - Some great images. These types are from the Samba, I had to show these images. I love the cutaway view. Finding these actual images is no easy task. Recreating them poster size would be amazing. Having one of them as a shirt would be phenominal. Please contact me if you find any. VEE DUBS & BITS 06.14.08 - Restoring an original rack. 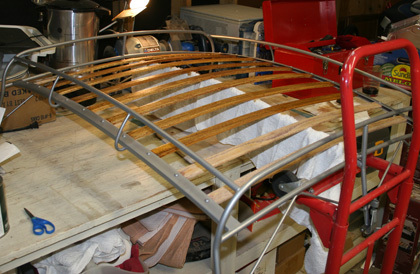 Early in April, before the last bug show, I made a committment to restore the wood on my original rack. This was a task, but I've been wanting to do it for years. 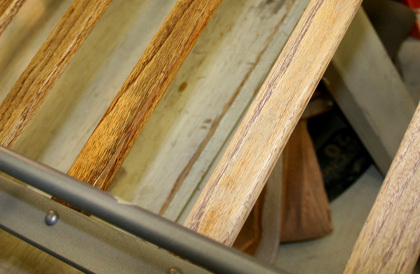 I began by sanding down the slats with a fine grain of sandpaper, starting with the top and finishing with the bottom. Here you can see the difference from the sanded slat to the finished slat. This view shows the full area that I worked in to sand and restore. I was told by my good friend james Farris to use "Marine-Spar Varnish" which I found at the local hardware store, a little expensive, $30.00 a gallon, but I used the remaining amount on my back deck which also came out looking great. 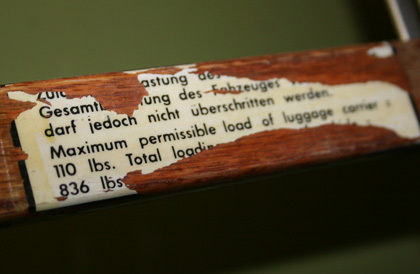 Sadly, what you see here is all that is left of the original sticker from Germany. Luckily though, I laminated the remaining parts with a UV protected laminant and hope this will will last for at least another 3-5 years. After about 3 hours of sanding and two days of finishing the rack is ready for show. Pretty smart looking! VEE DUBS & BITS 05.06.08 - Ads that I LOVE! This is a great vintage ad that ran in 1958, a year after my car was made. This has all the great photography of the 50's in light and shadow. Plus you can't beat an ad where the actors are smoking! Enjoy! 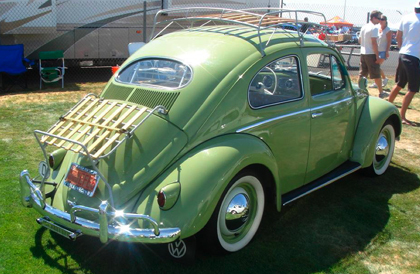 I entered the 2008 Bug-O-Rama at Phoenix Firebird Raceway this year for the first time in the "Vintage Stock" category. I eagerly and awkwardly arrived first at 6am and watched bugloads of other VDubs ramble in. I parked her in the grass and spent the rest of the day "ooo-ing and ahh-ing" over some of the nicest vintage, classic, and custom VW's I have seen gathered together at once. It was my second show I have ever been to and entered. Amazingly,I took second place for my division, I could'nt be happier it was a great experience and I met alot of new friends and connected with some old ones. It was a perfect day.